As modern smartphones continue to become more powerful and feature-rich, extending the battery life on these phones becomes an increasingly pressing issue for a growing majority of users. While it is questionable whether closing open apps actually saves battery life, there are several tactics and strategies that you can employ to help your cellphone battery last as long as possible between charges. The display on your smartphone consumes a lot of battery life and it consumes even more if the screen is brighter. 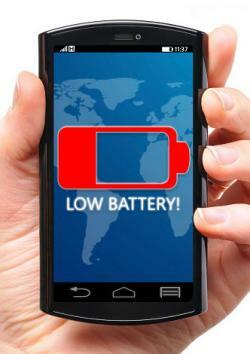 To prolong the battery life on your smartphone, dim the screen brightness as much as is comfortable. It is also helpful to shorten the screen timeout period too. This is the amount of time before the screen turns itself off after a period of inactivity. Move the slider as far to the left (dim) as is comfortable. Select a shorter period of time before the screen turns itself off. Drag the slider to the left to dim the screen. Select the desired timeout period. Touch General to go back and save. Disabling the auto-brightness or adaptive brightness feature can also help with battery life, as the automatic setting oftentimes leave the screen brighter than is necessary. If your smartphone has an AMOLED display, like many Samsung models, opt for a black wallpaper and dark themes too. This is because AMOLED screen technology is such that only illuminated pixels consume power and pure black pixels do not use any power. Your smartphone may be performing a series of actions without your explicit knowledge, including accessing features that you may never use or only rarely use. In certain builds of Android, for instance, manufacturers include a number of 'smart gestures' that can be deactivated in the settings to save battery life. Similarly, it can be beneficial to turn off the OK Google voice search function. This can be accessed through the Language & input section of the Android settings menu. If you are not currently using any Bluetooth devices, like headsets and game controllers, it is worthwhile to turn Bluetooth off. There can also be a slight benefit to deactivating the automatic screen rotation feature. Just as you can save battery life by deactivating features you are not using, you can also save a lot of battery life by strategically minimizing or disabling the background activity being performed by the various apps on your smartphone. Many of these will need to be configured on an app-by-app basis and the particulars will vary from app to app. A common example would be to reduce unnecessary app notifications. Retrieving notifications requires a connection to the Internet and the transferring of data, which consumes battery life. It is understandable to retain notifications for email and messaging apps, but perhaps you can disable notifications from mobile games and social media. These can be accessed through the settings menus in the individual apps. In the case of devices powered by Google Android, reducing the number of active homescreen widgets can also save a lot of battery life. A common example would be a weather widget. If the widget is updating the weather conditions or forecast every few minutes, even when the phone is inactive, it is consuming battery life unnecessarily. Lengthen the update period or remove the widget altogether. Less active widgets, like a calendar widget, will generally use less battery. Keeping the software on your smartphone as up-to-date as possible is highly recommended, not only for patching security issues, but also for optimizing the battery and memory usage. This is true both for the operating system, like Windows Phone, iOS or Android, as well as for the individual apps themselves. Google Android 6.0 Marshmallow comes with what is called Doze Mode. This minimizes the number of background processes when the phone is detected as being inactive. A similar feature was introduced for the iPhone in iOS 9 with Low Power Mode. Weak, inconsistent or unreliable reception on your cellphone can wreak havoc on its battery life as your phone continues to search for a signal. This becomes even more problematic when it is trying to transfer large amounts of data over the Internet. If you are going to stay in a single location for a period of time, like at home or at work, then connecting to the local Wi-Fi network for your Internet access is generally more efficient in terms of battery consumption. This assumes that the Wi-Fi network (and signal) is consistent, strong and reliable. You should also clear out saved Wi-Fi networks you no longer use. This way, your phone isn't constantly searching for networks to which you are unlikely to connect again. The way that your phone determines your physical location - and how frequently it does this - can also have an impact on battery life. Scroll to the Personal section and select Location. As its name indicates, 'battery saving' mode consumes the least amount of power. Alternately, you can disable location detection entirely if it is not needed. In the Location settings, you can also define which apps have access to your location. The iPhone does not have the option to select how the device determines your location, but you can turn Location Services on or off. You can also control which apps have access to the Location Services data. There are certainly times when you should be turning your phone to silent mode. However, vibration alerts tend to use more power than ringtones and audible alerts. It can be beneficial to disable vibration and to use low-volume alerts and ringtones instead. Disabling haptic feedback - the vibration function for tactile feedback - can help to save battery life on Android smartphones. Haptic feedback is oftentimes used during typing or interacting with the phone. Navigate to the Device section. The iPhone currently does not have haptic feedback with its keyboard and it cannot be configured separately from 3D Touch on supporting models. By utilizing the strategies and tips described above, you can conceivably save a fair amount of battery life on your cellphone. Even so, it can be very helpful to carry around a small USB power bank to provide your phone with a quick charge on the go. These battery packs are very affordable and compact, ensuring that your phone stays topped up and available for use no matter where you are.